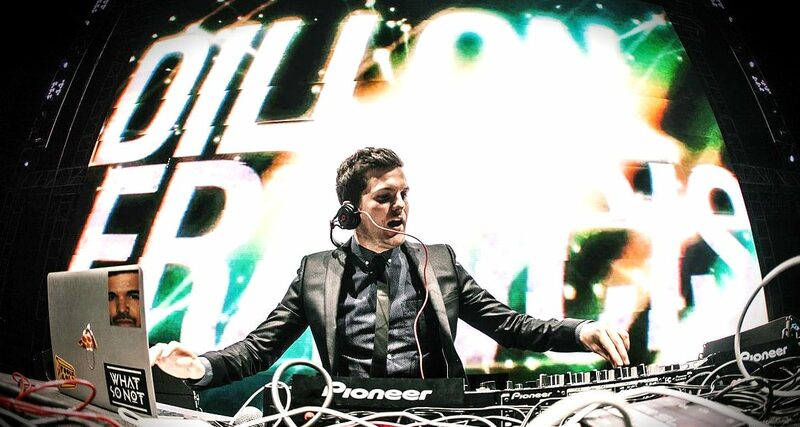 From tour vlogs and funny skits to interviews and music videos, Dillon Francis knows exactly how to maximise YouTube. Take note of our tips below to do the same. 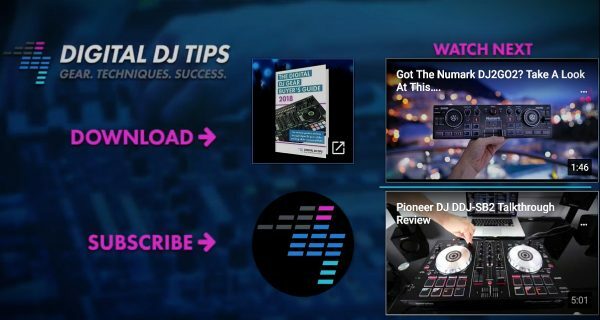 The first segment in our 12-part series on DJ/producer success talked you through building micro income streams, getting noticed with your killer content, and honing a unique aesthetic. In the social media space, we’ve discussed creating and maintaining high quality Facebook, Instagram and Twitter pages. Don’t underestimate the power of good lighting. A decent camera with excellent lighting is leagues better than an expensive one recording something that’s too dark or shadowy. Get yourself some decent soft box lights; a pair of them will do. I use LimoStudio lights like this in our weekly team video call at Digital DJ Tips, and even though it’s 6am for me during those, it gives the appearance of a happy, glowing, well-rested individual (wink wink). 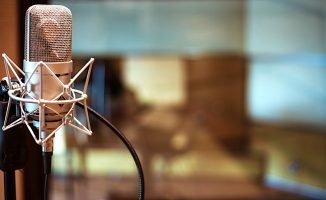 For recording voice, we recommend a vlogging microphone like the Blue Raspberry, and for visuals go for a lower-end Canon, Panasonic or Logitech C930e webcam, unless you want to splurge on the top end stuff. Make sure your edits are smooth and you develop a style, whatever that may be. On a budget, iMovie or the Windows equivalent do nicely, but you can opt for programs like Screenflow or Final Cut Pro X if preferred. When it comes to YouTube, there’s tons of helpful advice out there, such as: keep your videos between two and five minutes, because nobody has the time or attention-span for longer content. Another one is to make the most of your first 10 seconds, as 20% of viewers drop like flies after the intro. Along those lines, ensure that you’re opening and ending your videos in a memorable fashion. Have a certain way that you introduce yourself and always include a call to action at the end (to give you a boring example). Try to stick to two or three topics overall, as channels with a narrow focus do the best. Collaborate with other YouTubers, interview DJs and producers with a big following, participate in Q&As, and go “live” on the platform. 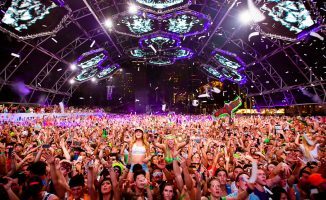 See what other DJs are doing, then do it better. All those tips aside, you’ll want to craft content that is informative, engaging, and entertaining. Where and when possible, make your videos “evergreen”, which means the content will be valuable to people irrespective of time. That’s roughly the secret sauce of a shareable YouTube video. Think back to your visuals in part three, as you’ll want to apply those here. Your channel art and photo should be professional and consistent across every platform. You’ll also want a cool and concise 30-60 second channel trailer that automatically plays when people visit your page. To get this right, ask yourself, “what can I offer potential subscribers?” then turn the answer into a video that sells itself. 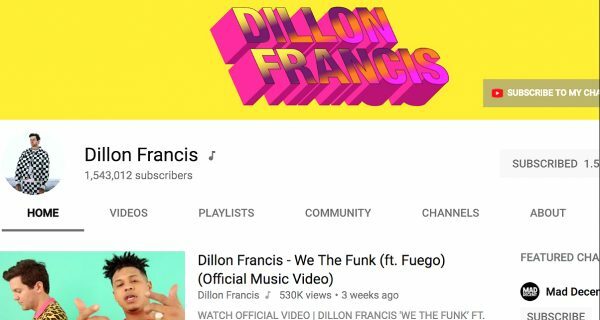 Keeping on with our Dillon Francis example, check out the use of bold channel art, a good profile picture, and a featured video. Good one, Dillon! The last piece of the branding puzzle is uploading custom thumbnails for every video, instead of allowing the platform to choose for you. It catches more eyes, increases the click-through rate, and well, it just makes your channel look good. Whatever thumbnail style you choose, establish your identity and be consistent. Go for short, catchy titles that don’t include the word “video” in it (YouTube already is a video content platform). You need to induce curiosity without being redundant or wordy, so think of phrases related to your content that will make people click through. In the description box write up a short paragraph on what the video entails, and include any relevant questions, links or additional resources mentioned. You want a nice amount of keywords in there so you can rank for SEO, however avoid going overboard; keep it readable and authentic. 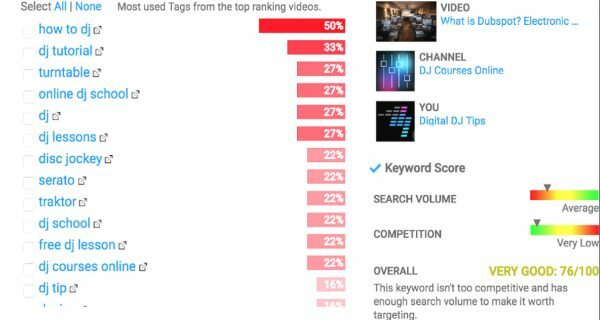 To let YouTube know what words you’d like your video to pop up for in search, tagging them with specific keywords is essential. Neglecting to do so is as bad for growth as forgetting hashtags on Instagram! For keywords, strike a healthy balance between high search volume and low competition. Look into tools such as TubeBuddy (what we use) to automate the entire process and thank us later. In TubeBuddy’s Tag Explorer, this is what pops up for the keyword “who’s the best online DJ school?” Nice to see we made the cut! The keyword scored 76 out of 100, which isn’t half bad. Keep in mind the more common a word or phrase, the worse the score. Writing a script for your videos not only keeps you on track while talking, but you can easily turn that script into closed captions, another area in which TubeBuddy is helpful. Why bother with this at all, though? Well, Google crawls the transcripts on YouTube videos and counts those as keywords ranking for search, however there’s a catch: videos benefit from this only if the creator manually uploads the captioning. There’s zero benefit to letting YouTube butcher your beautiful content with its poor (and sometimes hilarious) automatic subtitles. Maximising discoverability wouldn’t be complete without a discussion on community. Ask your viewers to answer a question in the comments or to suggest what they’d like to see next. Doing a weekly mixshow? Hand them the reigns and take suggestions on what you should mix in, or see if they’ll give you creative constraints on your next production. The more fun the call to action the better. You can’t expect growth in that sea of videos without engagement. Likewise, you should frequent relevant channels and comment underneath. It’s OK to interact on videos beyond your own, trust us. Answer questions or give props to the creator. YouTube is all about curiosity, so make yourself known in the community and see your subscriber count rise. Make playlists of your content to keep people inside your ecosystem. Separate your live sessions from your informal Q&As. People who watch one will likely watch another, and curating playlists makes that easy. Similar to Google rewarding those who painstakingly transcribe their videos, YouTube rewards channels with long watch times. The longer they watch your content, the longer they’re on YouTube, the more likely they are to see ads, and that makes YouTube happy. You now get bumped up in search results because YouTube thinks you’re pretty serious about this. Way to go! Want a call to action at the end of your videos? Customisable end screens are the way forward for getting viewers to take the next step. It beats YouTube controlling it for them. If you take one thing away from this article, let it be this: treat your content like a TV series and stick to a publishing schedule. Your audience will get in the habit of checking your channel every Monday for a new vlog or track upload, so don’t disappoint them. Congratulations, you have now completed your DJ/producer social media training. In the next installment of Zero To Hero, we’ll discuss using services like Tiny Letter to craft newsletters for your super fans. What’s your favourite YouTube channel, and why do you like it? Have you tried any of these tips? Let us know your thoughts below! Great article. I have just started building a youtube channel and your points are really great. How does this work in terms of content and copyright? 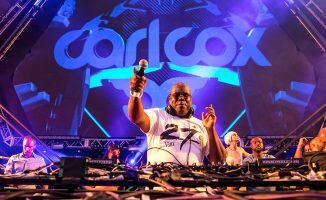 I understand that you have to be very careful about playing other peoples music which is what i often do as a DJ. Does this mean that my content will need to be more about the love of music rather than DJing skills? It’s a grey area, Kaylee. Usually you’ll find YouTube identifies the copyrighted content, and allows your video to stay up, but puts adverts over it (which benefit the record label/s concerned). But you can never be sure what’ll happen – sometimes, the tracks are blanked out (ie that part of your mix just goes silent!). When it comes to posting DJ sets is there a lisc. that I can get so Youtube doesn’t pull the video down? 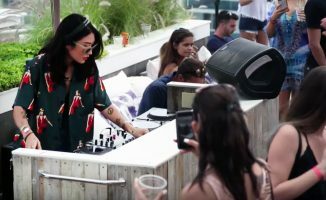 How do they major channels (Mixmag, DJ Mag, etc.) stream sets? It’s pot luck. Usually you “get away” with it, and YouTube instead allows the record labels to put adverts on your video to claw back some pennies each time it is watched.